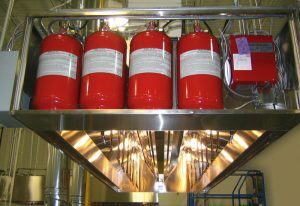 The KITCHEN KNIGHT II Restaurant Kitchen Fire Suppression System is a pre-engineered solution to appliance and ventilating hood and duct grease fires. 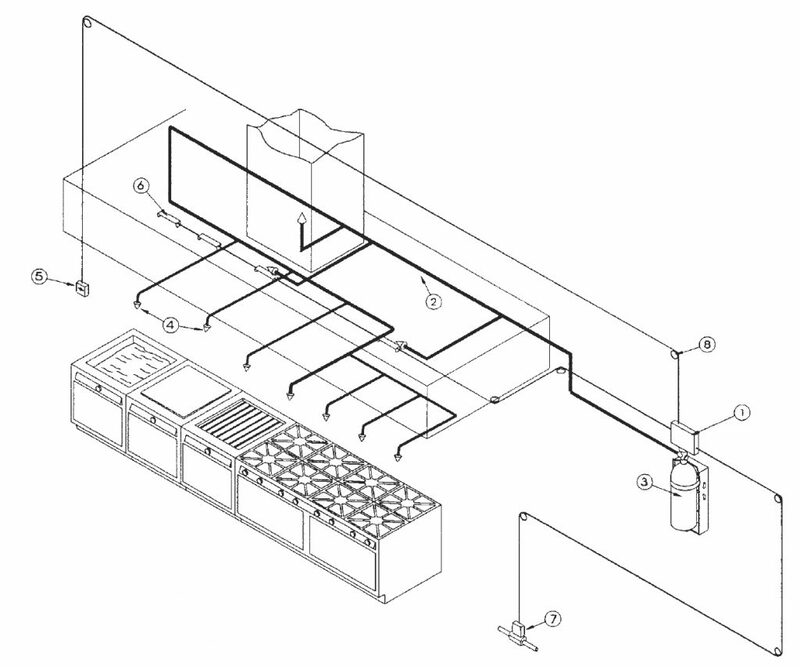 The KITCHEN KNIGHT II Restaurant Kitchen Fire Suppression System has been designed for protecting kitchen hood, plenum, exhaust duct, grease filters, and cooking appliances (such as fryers, griddles, rangetops, upright broilers, charbroilers and woks) from grease fires. 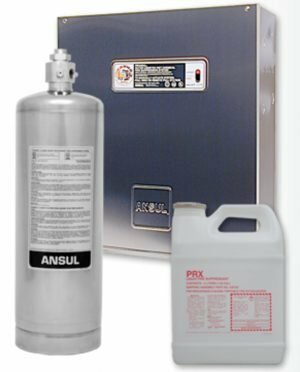 The versatile state-of-the-art wet chemical distribution technique, combined with dual, independent activation capability – automatic fusible link or manual release – provides efficient, reliable protection the moment a fire is detected. Once initiated, the pressurized wet chemical extinguishing agent cylinder discharges a potassium carbonate solution through a pre-engineered piping network and out the discharge nozzles. The wet chemical discharge pattern is maintained for a duration of time to ensure suppression and inhibit reignition. Expanded capability provides remote manual actuation, gas equipment shutdown, and electrical system shutdown. The operating temperature range of the PYRO-CHEM KITCHEN KNIGHT II System is 32 °F to 120 °F (0 °C to 49 °C). CYLINDER CONTROL HEAD – Integral design allows direct connection of the actuation pressure cylinder to the control head without the need of high pressure hose or pipe. Separate wire cable activation lines for automatic fusible links and remote pull station provide an added measure of safety. Unique technique for achieving necessary input wire cable tension. PIPING – Unbalanced piping network simplifies application design and installation. 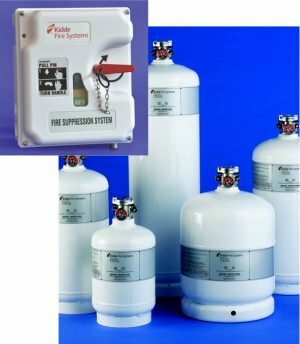 Requires no additional piping to connect system pressure cylinder to extinguishing agent container. Schedule 40 black iron, chrome-plated, or stainless steel pipe can be used. 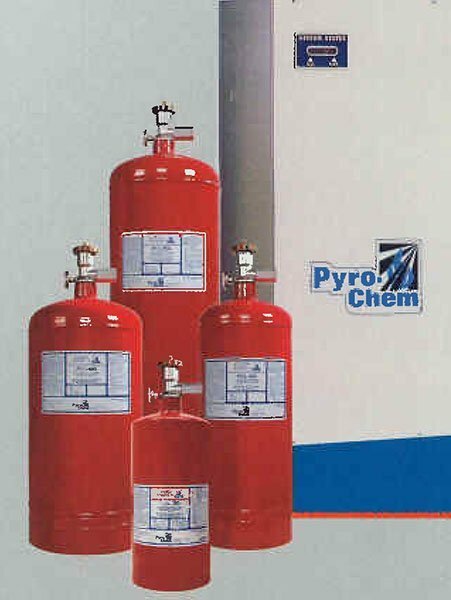 CYLINDERS – Contain PYRO-CHEM Potassium Carbonate wet chemical solution stored at 225 psig (15.5 bar). Includes pressure gauge for visual maintenance checks. 1.6, 3.0, 4.6, and 6.0-gallon sizes provide 5, 10, 15, and 20 flow point coverage respectively, offering a broad range of application coverage. NOZZLES – Can be fixed or fitted with a swivel adaptor allowing the nozzle to be rotated approximately 30° in all directions. REMOTE MANUAL PULL STATION – Simple operating instructions with double action release minimizes accidental manual operation of the system. Maximum limitations of 150 ft (45.7 m) cable run with 1/16 in. cable and 40 corner pulleys apply. A dedicated wire cable input line to the cylinder control head provides manual operation in addition to automatic operation utilizing fusible link detection. 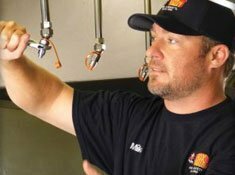 The pull station is compatible with flexible conduit. FUSIBLE LINK DETECTION EQUIPMENT – Accommodates both series and terminal placement to minimize inventory and simplify ordering. All necessary components are included for efficient assembly and installation. Fusible links rated for maximum ambient temperature must be ordered separately. Maximum limitations of 20 fusible links on a 150 ft (45.7 m) cable run with 40 corner pulleys provide substantial hazard coverage. AUTOMATIC GAS SHUT-OFF VALVE – Complies with requirements pertaining to the shut off of fuel as described by NFPA 17A. Can be reset at control head after regular maintenance/service check for convenience of service technician. Maximum limitations of 100 ft (45.7 m) cable run with 30 corner pulleys provide mounting flexibility. The gas shut-off valve is compatible with flexible conduit. CORNER PULLEYS AND ACCESSORIES – Designed to ensure reliable system function as tested by Underwriters Laboratories. AGENT DISTRIBUTION HOSE (Not Shown) – Kitchen appliances manufactured with or resting on caster (wheels/rollers) include an agent distribution hose as a component of the suppression system. 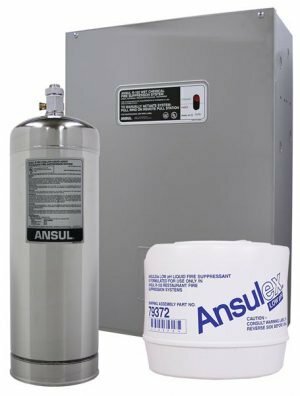 This allows the appliance to be moved for cleaning purposed without disconnecting the appliance fire suppression protection. The hose assembly includes a restraining cable kit to limit the appliance movement within the range (length) of the flexible hose. FLEXIBLE CONDUIT (Not Shown) – Flexible conduit allows for quicker installations and the convenience of being able to route the cable over, under and around obstacles. Flexible conduit can be used as a substitute for standard EMT conduit or can be used with EMT conduit. Flexible conduit can be used only with the Remote Manual Pull Station and Mechanical Gas Valves.